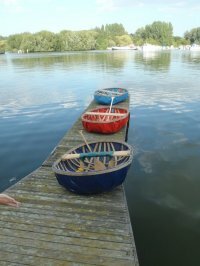 Alistair Phillips is an experienced self-taught wood craftsman, living and working in the Chiltern Hills in South Oxfordshire. 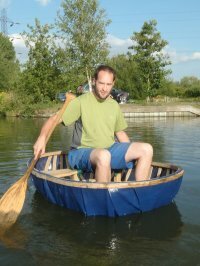 His specialities are making coracles, and producing wooden bowls and plates for table-ware. Virtually all of his timber is sourced from within the Chiltern Hills area, from local sawmills, from private woodlands, and from local Nature Reserves. He also uses reclaimed timber. 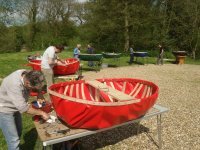 Courses are available in coracle making from Alistair’s own workshop at Rotherfield Peppard, near Henley on Thames in south Oxfordshire. Turned wares are sold at a variety of shows and festivals throughout the year. Please view the News & Events page for details of upcoming craft fairs. To fully satisfy his passion for woody goodness he also works part-time for Oxford Wood Recycling, a social enterprise dedicated to the recovery and reuse of reclaimed timber. Alistair graduated from Reading University in 2004 with a BSc (Hons) in Landscape Management.